Adorable Retro Kitsch is full of cute vintage ornaments including lots of animal ones - in particular cats and dogs! I am partial to some kitsch decor once in a while so I decided to go for one of the lovely cat ornaments! 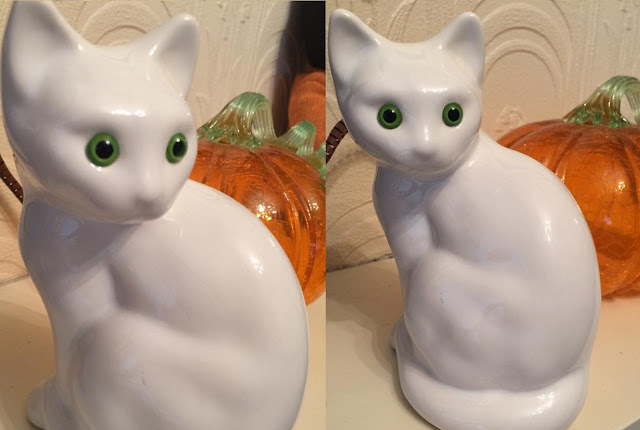 I already have a couple of vintage kitties ready to be displayed in my new home but I wanted a white one and found a really cute one on this Etsy shop. Here's the little kitty (displayed alongside my lovely glass pumpkin from Homesense). I had to give her a little wipe down with a baby wipe as she was a bit dusty but she's so lovely. She will look gorgeous on a shelf amongst my cute nick nacks, teacups etc in my new house! Check out Adorable Retro Kitsch for lots of cute cat ornaments, the shipping was really quick too and she was packaged up super securely which is always a plus.